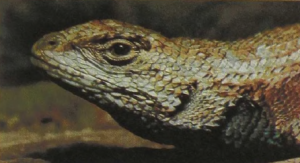 The various fence lizards are also known as spiny lizards, so called as each scale of their body bears a keel that terminates in a sharp, backward-projecting point. 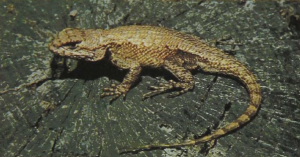 This is the common iguanid of the eastern and central United States, where it is found on rock and wooden fences and the boles of trees. Fence lizards grow to 3 inches in head and body length with the tail about half as long again. They climb well on rough surfaces onto which their claws can catch hold. As in many other iguanid lizards the males have a distinctive coloration, in this case brilliant-blue regions on the throat and the sides of the belly. It is interesting to note that while these signal colors can be displayed to passing fence lizards, they are in relatively well-hidden places on the body and are unlikely to be perceived by a predator looking down from above.